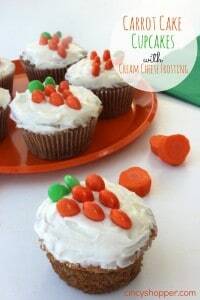 We love carrot cake so these Carrot Cupcakes with Cream Cheese Frosting were a hit today after school. 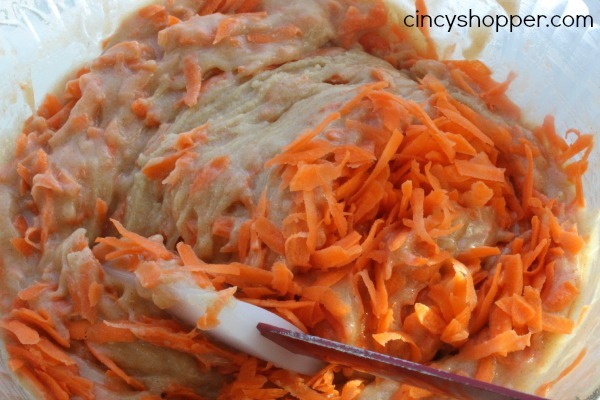 We love carrot cake all year long. My daughter and I will quite often scour Kroger Bakery markdowns for a full or individual Carrot Cakes for two. Not just at Easter but, all year long. During the Easter holiday season we seem to consume more than usual. While the kids were at school I decide to surprise them with some yummy carrot cupcakes with cream cheese frosting. Partially because I wanted to make them happy. This momma was looking forward to this yummy treat for herself, ha ha. 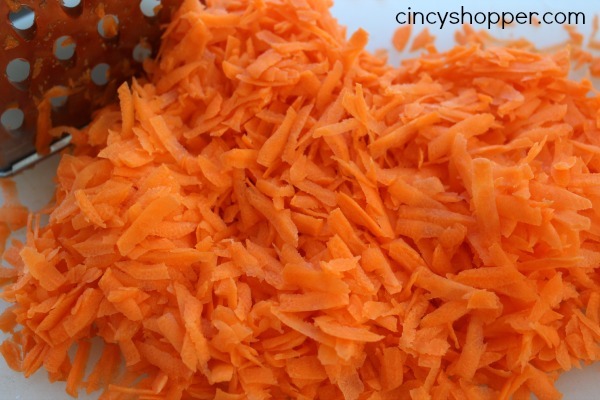 It is difficult to admit but I have never made a carrot cake or carrot cupcake in my life. Yup, the first time ha ha. It was so easy and they were so tasty I plan to do it again (maybe for Easter dessert). Carrot Cake and Cream Cheese icing are like a dream. The flavors work so perfect together. 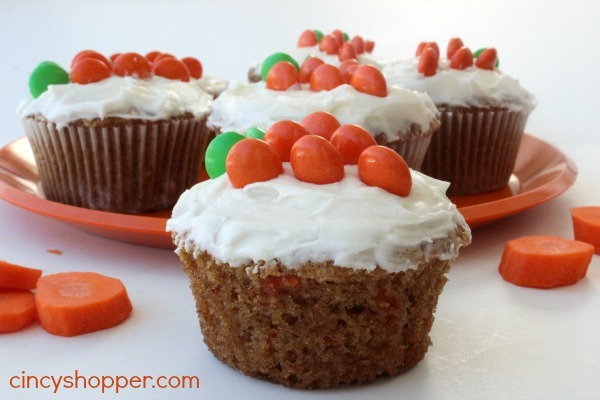 We did add some Reese’s Pieces to the top of our cupcakes in the shape of a carrot. I thought they really set the cupcakes off. Just too cute. Put cupcake liners in muffin tin. 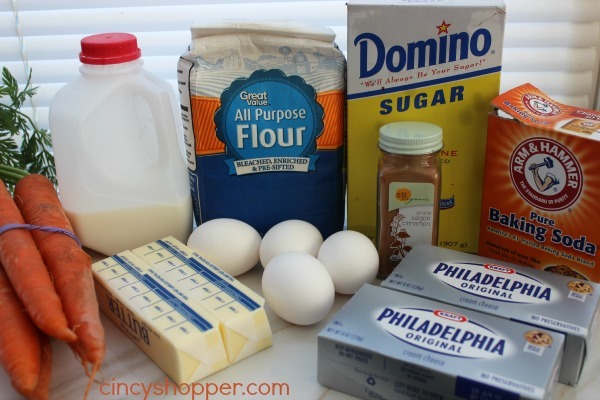 Combine flour, sugar, cinnamon and baking soda in a bowl and mix well. In large bowl, beat eggs and slowly add oil while continuing to beat. Add flour mixture to egg mixture and mix well. Bake 20 minutes or until toothpick inserted in center comes out clean. Cool cupcakes in pan 10 minutes then move to cooling rack to finish cooling. Easter is always a great time to enjoy Carrot Cake or Carrot Cupcakes but if you are like my daughter and I, you will enjoy this Carrot Cupcakes with Cream Cheese Frosting all year long. If you are looking for other great Easter Ideas be sure to check out the Easter/Spring Cake Cookies, PEEPS Cupcakes, Sheep Cupcakes, Homemade Butterfinger Eggs, PEEPS S’Mores, Easter Chick Deviled Eggs, Nutter Butter Chicks, Reese’s Peanut Butter Eggs Coconut Cream Eggs, Coconut Birds Nests Cupcakes, Easter Egg Cake Bites PEEPS Pudding Cups and the Chocolate Covered Peeps that I have shared this past week. I will be sharing some great recipes and DIY Crafts for all of your Easter Holiday needs in the next few weeks.